Interview call letters have been issued for Specialist Officers in SMGS – IV. Eligible candidates can download the same at the official portal of Dena Bank till 16 November. Interview for the post of Chief Manager (Credit Risk) and Chief Manager (Operation Risk) will be conducted by Dena Bank. Applications for the same were invited in the month of June. Dena Bank has allowed candidates to download the call letter till 16 November, therefore candidates are suggested to download it beforehand, in order to avoid last minute hassles and server issues. How to download Dena Bank SO Post Interview Call Letter? 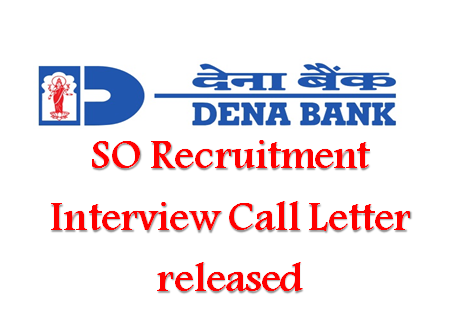 Important Note: Candidates are suggested to download the interview call letter from the official website of Dena Bank. Candidates should take extra care while giving details of their registration number and password. In no case should candidates reveal the information at any spam link. It is for the information of candidates that in case the downloading process is taking lots of time, then leave the page for a while and then retry. Many factors are involved like internet speed, large number of applicants, server issue, etc. Candidates are also suggested to download the interview call letter during the offpeak hours. About Dena Bank SO Recruitment: Dena Bank is one of the leading Public Sector Banks of the country. The Bank conducts strict recruitment process time and again to fill up the vacancies generated. The Bank seeks applications from graduates, MBA degree holders and others with relevant educational qualification required for the respective job.